Having been elected to be a 2008 Obama National Delegate and attend recent California State Conventions first as an observer and then as an alternate, I can tell you that there is nothing quite like being in a convention center or, in my case , a Mile High Stadium in Denver with "50 Thousand" or so like minded folks. You can be the change, you really can make a difference, and make many new friends in the process. The following notice showed up in my inbox and I am passing along. In 2010 California Democrats bucked a national trend and won eight of nine statewide offices, with the race for Attorney General still being counted. A huge part of our success was because California Democrats from up and down the state volunteered their time, made phone calls, donated money, knocked on doors, and participated in our biggest Get out the Vote effort ever. The California Democratic Party will hold elections in each of California’s 80 Assembly Districts on January 8 & 9, 2011. At these meetings, registered Democrats will elect 12 delegates from each Assembly District to be members of the California Democratic Party State Central Committee. Now is your opportunity to help direct the future of Democrats in California! Delegates approve the platform of the Party, elect Party officers and endorse candidates for congress, state legislature, and executive office. If elected, you will automatically become a delegate to the California Democratic Party’s state convention, which will be held April 29 – May 1, 2011 in Sacramento, as well as the convention in 2012. If you are interested in running you must file with the State Party by 12:00 noon, Thursday, December 9, 2010. The Assembly District Delegates (ADDs) and Assembly District Executive Board representatives ("EBd Reps") are elected at Assembly District Election Meetings (ADEMs) held in each of the 80 Assembly Districts. The California Democratic Party is convening ADEMs on January 8 and 9, 2011, where 12 people (6 men / 6 women) from each Assembly District will be elected to represent their district for both the 2011 and 2012 State Conventions. Online filing for ADD will begin on November 9 and will run through December 9, 2010. Washington - Imagine an election in a Third World nation where a small number of millionaires and billionaires spent massive sums to push the outcome in their preferred direction. Wouldn't many people here condescendingly tut-tut such a country's "poorly developed" sense of democracy and the inadequacy of its political system? That, of course, is what is going on in our country as you read this. If you travel any place where there is a contested race for the House or Senate, you are bombarded with attack ads, almost all against Democrats, paid for by groups that do not have to reveal where their money comes from. What we do know from enterprising journalism and the limited disclosure the law requires is that much of this money is donated in large sums from a rather small number of wealthy individuals. And The New York Times reported last Friday that among the 10 top-spending organizations this year, five are Republican-oriented shadow groups. Another four are the formal party committees for House and Senate candidates. One is a union. This is a huge, historic deal, yet many in the media have treated the spending avalanche as a normal political story and arguments about its dangers as partisan Democratic whining. Some have even maintained that money doesn't really matter in elections, which makes you wonder why people who know quite a lot about politics (one thinks of Karl Rove) have spent so much energy organizing these fundraising and advertising efforts. The outside money should be an issue for Democrats. They ought to be asking, even more forcefully than they have been, what these secret donors expect for their money. You can be sure that the benefactors will not keep their identities hidden from the members of Congress they help elect. Only the voters will be in the dark. Nonetheless, the partisan dimension should not distract from the larger problem facing American democracy. Secret money is dangerous. Secret money corrupts. Secret money is antithetical to the transparency that democracy requires. And concentrated money, which is what we're talking about here, buys more influence and access than small contributions. Candidates have limits on the size of the donations they can raise and must disclose them. They are accountable for the advertisements they put on the air. But the outside groups can say whatever they want without answering for it. Washington Post blogger Greg Sargent has been tireless in pointing out how many of the ads sponsored by these shadowy organizations are based on half-truths or outright lies. It's often been said that what the Republican-leaning groups are doing now is no different from what some Democratic-friendly groups have done in the past. There's actually an important distinction. But first, let me say I didn't like it when Democrats took a step in this direction in 2004, and was critical when Harold Ickes, one of the party's seasoned operatives, organized outside money on John Kerry's behalf. I called the move "shortsighted," and said then: "My hunch is that in the long run, the country -- and, yes, especially Democrats -- will regret opening a new loophole in the campaign money system." Republicans, I predicted, would "find more than enough rich people to finance groups on the Ickes model" and eventually outspend the Democrats. Please select the link above for the complete piece. It is up, not only to Democrats, but Republicans, Independent, and Tea Party folks -- ALL AMERICANS, to demand an end to this Nuclear $$$ explosion, or this USA is "Toast." Former Massachusetts Gov. 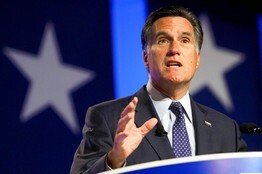 Mitt Romney is solidifying ties with traditional party leaders and organizations by helping them with fund raising and candidate endorsements. The two potential rivals are acting on opposing assumptions about the newly energized but volatile tea party-infused Republican base. The results of their decisions will show the impact that tea-party supporters will have on the 2012 presidential race, and on the new political scene to emerge after the Nov. 2 midterm elections. Their calculations will also help determine whether the tea-party movement, with its antipathy toward establishment Republicans, will accept a longtime party insider such as Mr. Romney or Mr. Gingrich as a presidential nominee, or look elsewhere for a fresh-faced outsider. Mr. Romney's team, according to advisers, is betting that the tea-party groundswell, while energizing fiscal conservatives, doesn't mark a fundamental shift in the preferences of GOP voters. His team believes activists animated by fiscal discipline and the size of government could see Mr. Romney as a conservative Mr. Fix-It for the economy. Mr. Gingrich views the tea-party revolt as the dawn of an enduring movement, and he has spent more time courting tea-party activists than forging ties to Republican party leaders. Mr. Gingrich has recast his American Solutions group, launched in 2007 to press for expanded oil drilling and other policy initiatives, into a tea-party clearinghouse of sorts—creating a curriculum to teach activists, small business owners and first-time candidates how to run campaigns. He is keeping in touch with this potential army of volunteers. Where Mr. Romney's political action committee has directed $944,000 to candidates and party organizations and paid for the former governor to attend scores of campaign events, Mr. Gingrich's staff says he has given a far smaller sum, $13,000, to candidates. 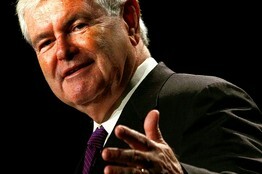 Mr. Gingrich has also guided small-dollar donors to give about $200,000 to candidates, his aides say. Mr. Gingrich has raised about $24 million this election cycle for American Solutions. "We've now begun building an electronic system to build a wave of change at every level," Mr. Gingrich said in an interview. "This is a fight that virtually every tea partier will identify with." 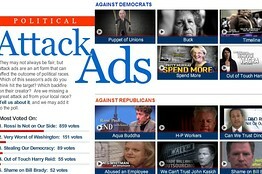 Get a look at some of the ads campaigns are running to embarrass their rivals -- and vote for the most effective. 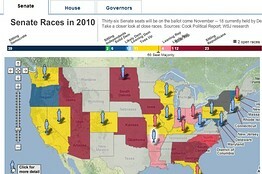 See which House, Senate and governors' races are considered closest. Mr. Romney's spokesman, Eric Fehrnstrom, said the former governor's 2010 focus on helping candidates and party officials would boost the tea party, as well. The two approaches correlate with the way Republican voters view each contender—and they show how the movement's rise has complicated matters for potential 2012 candidates by dividing the GOP into three camps. According to a recent Wall Street Journal/NBC News poll, one third of Republicans say they don't back the tea party. Among this group, a slight plurality says Mr. Romney is the GOP's "most important leader." One third of Republicans support the tea party so strongly that they describe themselves as part of the movement more than they identify as Republicans. Among this group, Mr. Gingrich is considered the GOP's "most important leader"—ahead of former Alaska Gov. Sarah Palin, who has tied herself closely to tea-party candidates this year. This is why I have suggested that those in the middle and Democrats need to start a full court press on November 3rd. They MUST keep the heat on relentlessly. Silver Lining: History shows that if the opposition party holds one or both houses of Congress, the easier it is for the sitting President to be re-elected. Thanks, Tea Party? Cutting Through All The Mudslinging and taking a honest, factual look at what, given all the Republican obstacles, was accomplished for the American people in the last two years. Simply Amazing once all the campaign news clutter is taken away! Extension of Unemployment Benefits, to extend benefits to millions of Americans who have lost their jobs in the Bush recession and to stimulate economic activity. Hate Crimes Prevention, to extend federal protection to people who are victims of violent crime because of their gender, sexual orientation, gender identity, or disability. The Education Jobs and Medicaid Assistance Act, to save or create the jobs of 161,000teachers, and thousands of police officers, and firefighters while closing tax loopholes that encourage big corporations to ship American jobs overseas. The HIRE Act, to provide tax incentives for businesses to hire more Americans (4.5 million Americans have already been hired) and unleashing billions of dollars to rebuild highways and other infrastructure, and to crack down on offshore tax havens for the wealthy. The Worker, Homeownership, and Business Assistance Act, to boost the American economy and create jobs, expand the 1st time homebuyers' tax credit, and enhance tax relief for small businesses. The U.S. Manufacturing Enhancement Act, to help American manufacturers compete by temporarily suspending or reducing duties on materials and products which are not made domestically. Children's Health Insurance legislation, to provide affordable health care coverage to 11 million children, who would otherwise go without coverage. Tobacco Regulation, to have the FDA regulate the manufacture and marketing of tobacco, especially to children. Budget Blueprint, to create jobs through investments in health care, clean energy, and education, reduce taxes for most Americans, and cut the Bush-deficit in half by the year 2013. Statutory Pay-As-You-Go (PAYGO), to bring back the Clinton-era rule that requires all new policies that reduce revenues or expand entitlement spending be offset over five and ten years and therefore not increase the deficit. This spending rule led to the record surpluses during the Clinton Administration. Caregivers and Veterans Omnibus Health Services, to provide help for those who provide care to disabled, sick, or injured veterans and improve health care services to women veterans. Repeal of ‘Don't Ask, Don't Tell,' to end this outdated policy, contingent on the certification that military review was completed and that repeal would not impact readiness. The DISCLOSE Act, to respond to the Supreme Court's decision on Citizens United that threatens corporate takeover of our elections. The measure requires CEOs to stand by the political advertising funded through their corporate treasuries, expands disclosure requirements, and prohibits foreign countries from exercising influence in the funding of U.S. elections. Response to the BP Oil Spill, to eliminate the $75 million cap on oil company liability, restore the Gulf Coast, increase safety requirements and oversight on offshore drilling, and protect local residents. Home Star Jobs legislation, to incentivize consumers to make their homes more energy efficient, create 168,000 jobs, reduce energy bills for 3 million families, and reduce America's dependence on fossil fuels and foreign oil. Really, how can one educate themselves with these facts, and vote Republican? ELK GROVE, CA -- Today, Big Oil joined with Wall Street to rescue one of their staunchest allies: Dan Lungren. Under the direction of Karl Rove's shadowy organization American Crossroads, these two corporate special interests began pouring thousands of hidden dollars into the Sacramento media market, hoping to protect one of their greatest investments in Congress. "Karl Rove, Big Oil and Wall Street lining up behind Dan Lungren confirms what voters already know -- Lungren is looking out for himself and his corporate campaign contributors, not middle class families," said Lucinda Guinn, Bera for Congress campaign manager. "Lungren opposes campaign transparency, and now his friends can launder their contributions through Karl Rove -- if he wants to fight for corporations instead of Californians he should go back to lobbying for Bear Stearns." American Crossroads is funded and operated almost exclusively by Wall Street special interests, corporate lobbyists, and Big Oil executives -- including a former Enron lobbyist, the owner of the financial investment giant AIG, and the manager of one of the world's largest hedge funds. As of June, 97% of the money American Crossroads raised came from four billionaires, including two oil and gas billionaires. For his part, Dan Lungren has taken over $84,000 from the oil and gas industry, over $248,000 from the financial industry, and in return is doing their bidding in Congress -- voting in favor of a $2.6 billion tax break for Big Oil and against limits on executive compensation for bailed out banks. Even more egregious, by voting against the DISCLOSE Act and supporting the Citizens United Supreme Court decision, Dan Lungren supported the very same loopholes being exploited by Karl Rove and American Crossroads to hide the identity of their donors. Dr. Ami Bera, a Democratic Party candidate who appears to be bucking the national trend has issued a summary of Dan Lungren's actions as they see it and for voters to consider. The clear question the Bera campaign is asking, when this blogger spoke with the campaign today, is: "Will you call Dan Lungren and ask him to explain his words vs. his actions detailed below?" This entry cross posted by FreeFlightNewMedia.Typepad.Com.